It's that time of year again...film festival season! Cal and I are attending CIFF (Cleveland International Film Festival) and AFF (Atlanta Film Festival) respectively, so you'll get lots of great reviews on movies you might otherwise not have heard much about. I know last year I saw two movies at AFF that made my Top 10 Movies of 2014, so here's to hoping this year is even better! 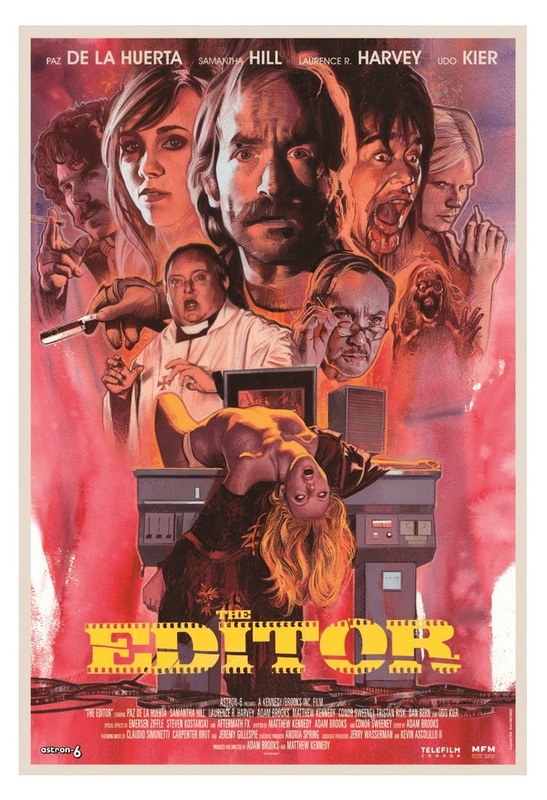 To kick this year off, I got a chance to see The Editor, a horror-comedy film put out by the Astron-6 team. They have been putting out genre movies for a couple of years now such as Manborg and Father's Day. The latter film started as a fake trailer and got picked up to be produced into a feature by Troma, but the experience with the legendary trashy-horror production house led to the creation of No Sleep, No Surrender, a documentary about the resulting battle between Astron-6 and Troma. This got them a lot of attention in the world of horror aficionados, so there's a bit of hype behind their newest release–or as much hype as a parody of Italian giallo films can get. The Editor follows Rey Ciso (Adam Brooks, also one of the directors), who once was the world's greatest film editor. Following a bizarre and tragic accident that left him with four wooden fingers on his right hand, Ciso has been stuck editing trashy horror films. The post-production house of one of these films becomes the background for a series of grisly murders. As the victims begin to pile up, the police inspector (Matthew Kennedy, the other co-director) begins to suspect Ciso, since all of the victims have the same fingers removed from their right hands. It is impossible to start anywhere but here: The Editor is an incredibly accurate parody of the giallo, and not just in its purposefully overwraught plot or the small part played by gialli regular Udo Kier. Perhaps the most elaborate element of the homage is in the sound; although the production is all Canadian, it is dubbed as if it was originally shot in Italian. It's dubbed poorly–just like original giallos–but not to the point of distraction. The dialogue, too, is sloppily "translated," maybe best exemplified by Rey's pronouncement upon walking through his door of, "Honey, I am in our home." While much of the style boils down to clever gags that recall the silly idiosyncrasies of classic gialli, but the cinematography and lighting is on another level entirely. The film is shot very well, both accurate to what it emulates and on its own. It recalls some of Argento's best in the use of color; many scenes are draped in evocative dark blues while others are drenched with bloody red shadows. It's quite impressive and a genuine pleasure for fans of stylish 70s horror. Despite all the things I really enjoyed about The Editor, I have some problems with its representation of women. I know that killers of women are often the villains in horror films, and I don't have any issues with the actual murders here; there are almost as many men killed as women, and some of the women in the film actually hold a lot of power in the struggles. However, there is a theme of ongoing casual violence towards women that is played as a joke that is a little cringe-worthy. The film plays it as a joke, that the men have to slap their women to keep them under control, but I'm not sure at whose expense the often repeated joke actually is. Although the tone is totally different, The Editor recalls many of the interesting ideas in 2012's Berbarian Sound Studio. The theme that working on a film is somehow the the place where the line between fantasy and reality is thinnest is played well here, and in wonderfully visual ways. This is done both dramatically and comedically, both equally fun: in one scene, Rey finds himself staring through his editing screen from the other side, unable to stop the murder about to happen in his studio; in another, we learn that he went mad trying to edit history's longest film. The Editor is a film that has a very specific audience, and if you're in that audience, it's fun as hell. It hits many of the right notes and feels authentic to the style and yet wholly original in how it achieves that authenticity. While it is fun as a comedy, I can't help but feel that I would have enjoyed it more if it had played it straighter and without all the women having sense and passion slapped into them. All the same, the movie is fun and surprisingly slick given it's b-horror exterior–if your a fan of highly stylized and over-the-top horror, there's a whole lot to love here. The Editor has screened at such festivals as TIFF and the Chicago International Film Festival. Stay tuned to theeditormovie.com for details on wider distribution.